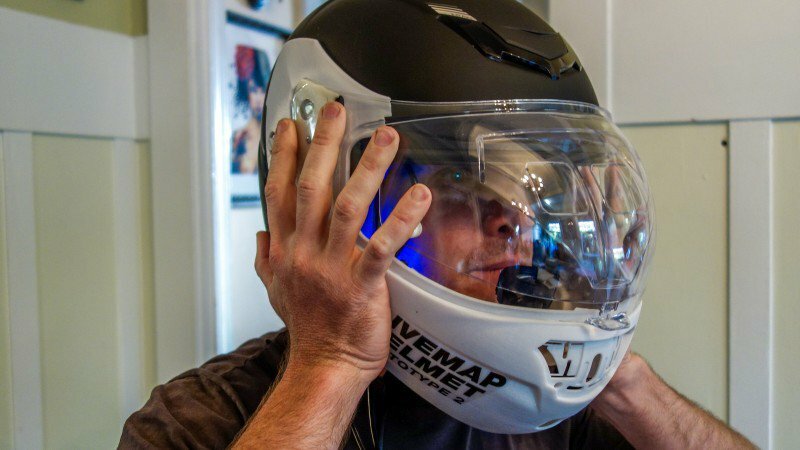 Will Your Next Motorcycle Helmet Have a Heads-Up Display? Picture a heads-up display inside a helmet and you probably imagine something like the one from Iron Man. But most consumer products—snowboard goggles, Google Glass, etc—instead have a tiny micro display housed at the edge of your peripheral vision.It’s less of an information overlay and more of an extra screen that you struggle to see. Its this disparity that Russian tech entrepreneur Andrew Artischev is trying to remedy with his new LiveMap motorcycle helmet. We got to try an early prototype, and are excited to report that it genuinely made us feel like Tony Stark. Artischev’s background is in apps, not optics. He was inspired to create a HUD motorcycle helmet after scouring bike shops in Moscow for what he was sure must exist, but that he couldn’t find. He knew that giving motorcyclists easier access to information about navigation, speed, and the performance of their bikes made sense. He just needed to figure out how to pack all that data, plus a display, into a skid lid.